Capaldi passes the sonic screwdriver to Jodie Whittaker in tonight's Christmas special (called "Twice Upon a Time"), she'll be the first lady Doctor ever. 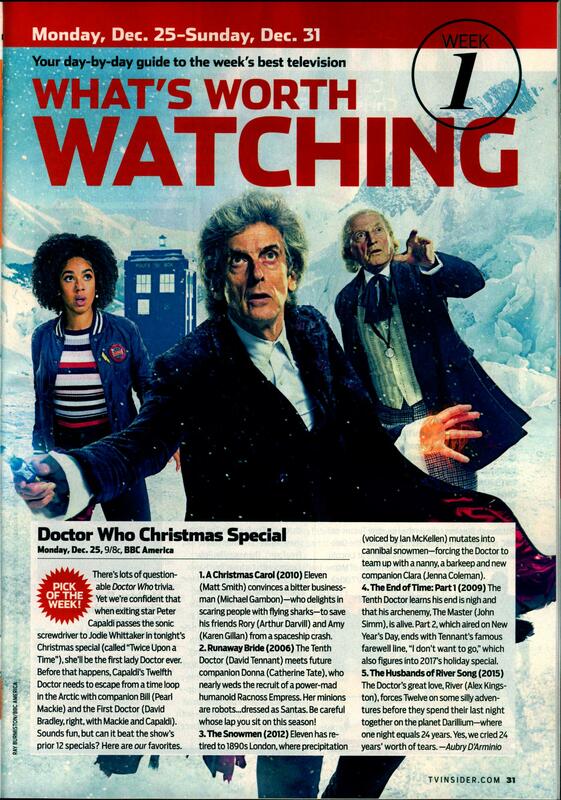 Before that happens, Capaldi's Twelfth Doctor needs to escape from a time loop in the Arctic with companion Bill (Pearl Mackie) and the First Doctor (David Bradley, right, with Mackie and Capaldi). Sounds fun, but can it beat the show's prior 12 specials? Here are our favorites. A Christmas Carol (2010) Eleven (Matt Smith) convinces a bitter businessman (Michael Gambon)—who delights in scaring people with flying sharks—to save his friends Rory (Arthur Darvill) and Amy (Karen Gillan) from a spaceship crash. Runaway Bride (2006) The Tenth Doctor (David Tennant) meets future companion Donna (Catherine Tate), who nearly weds the recruit of a power-mad humanoid Racnoss Empress. Her minions are robots...dressed as Santas. Be careful whose lap you sit on this season! The Snowmen (2012) Eleven has retired to1890s London, where precipitation (voiced by Ian McKellen) mutates into cannibal snowmen—forcing the Doctor to team up with a nanny, a barkeep and new companion Clara (Jenna Coleman). The End of Time: Part 1 (2009) The Tenth Doctor learns his end is nigh and that his archenemy, The Master (John Simm), is alive. Part 2, which aired on New Year's Day, ends with Tennant's famous farewell line, "I don't want to go," which also figures into 2017's holiday special. The Husbands of River Song (2015) The Doctor's great love, River (Alex Kingston), forces Twelve on some silly adventures before they spend their last night together on the planet Darillium—where one night equals 24 years. Yes, we cried 24 years' worth of tears. APA 6th ed. : D'Arminio, Aubry (2017-12-25). Doctor Who Christmas Special (2017). TV Guide p. 31. MLA 7th ed. : D'Arminio, Aubry. "Doctor Who Christmas Special (2017)." TV Guide [add city] 2017-12-25, 31. Print. Turabian: D'Arminio, Aubry. "Doctor Who Christmas Special (2017)." TV Guide, 2017-12-25, section, 31 edition.